The Ford Fiesta has been the best selling car in the UK for eight years straight. That’s a long time to hold the top spot and a lot of pressure for an all-new model to have on its pillars. So the question is, how does Ford make Britain’s favourite car even better without destroying its legacy? With a face lift (or several faces if you consider all the models as individuals), plenty of customisation options and a whole lot of connectivity and driver assist technologies. That’s how. 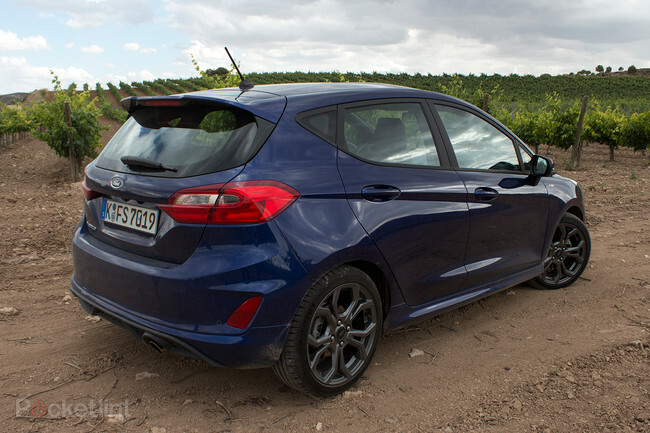 The all-new Ford Fiesta is everything a Fiesta fan would want it to be in terms of design. Its charm is retained, as is the bold styling – but things are more refined in the seventh-generation model with a more elegant appearance, with straighter, simplified lines and a softer sculpture. The centre bulge found on the 2008 model’s bonnet has been removed for a smoother finish that highlights the new model’s wider grille and the wrap-around headlights, while the side profile is less wedge-shaped with a play on light reflections and shadows to create lines. The 2017 Fiesta is longer and wider – 71mm and 13mm respectively, if you’re counting – for a more serious stance, while the rear sees new horizontal lights with a C-shaped pattern rather than the 2008 model’s vertical lights. The overall appearance is a fuss-free uninterrupted design that oozes premium appeal. Ford Fiesta (2017) review: Which model and extras? 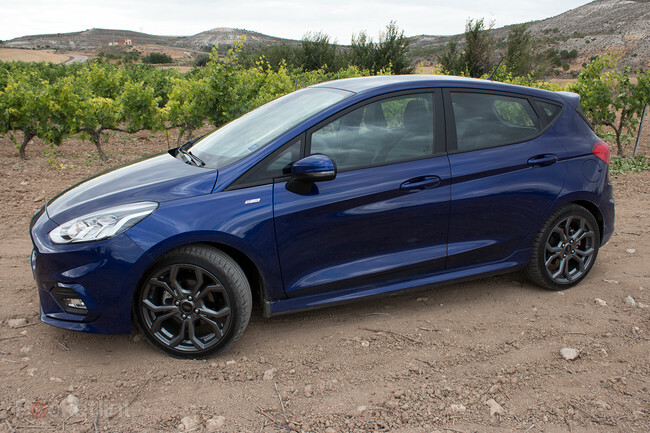 There are several variants of the new Fiesta available: Style, Zetec, Titanium, ST-Line and Vignale. There is also a performance ST model and a more rugged Active model coming at the beginning of 2018. All of these come in three and five-door variants. Unlike the new Nissan Micra, the five-door Fiestas have normal handles on the rear doors rather than integrated ones. But the finished look isn’t comprised as a result. There are personalisation options too. These aren’t as vast as the likes of the Fiat 500, but you can select contrasting roof and door mirrors to make your Fiesta standout from others on the road, with a total of 29 two-tone options available. Wheel trims range from 15-inch steel wheels with covers to optional 18-inch alloys. Opt for the ST-Line, which is our favourite, and you’ll find yourself with a sportier finish compared to the Style, Zetec and Titanium models, a Ford-Performance inspired grille, rear spoiler and a more angular and aggressive look with a 10mm lower ride height. The ST-Line also features metallic 17-inch alloys as standard. However, it’s important to note it’s not a fully-fledged ST, i.e. the ST-Line doesn’t get an engine upgrade. The top-of-the-range Vignale model, meanwhile, features the Ford Vignale bespoke grille (which looks like it is made up of small flying seagulls), foglamp surrounds, a smiling bumper feature line, 17-inch 10-spoke alloys as standard and an all-round more luxurious finish inside. It’ll cost more, but it looks great. 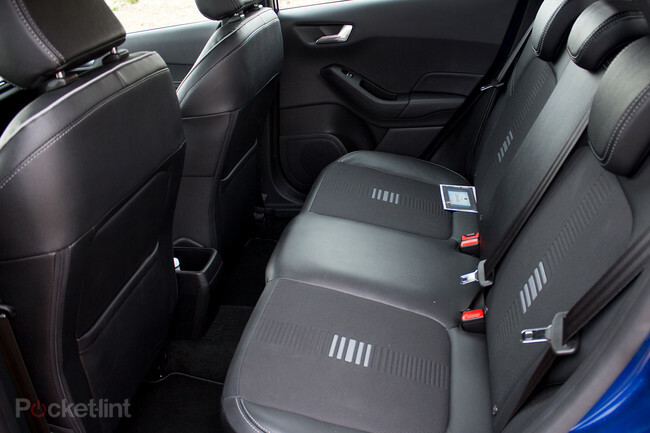 The interior of the new Ford Fiesta has been streamlined, too, on all models. There are almost 50 per cent fewer buttons compared to the 2008 Fiesta, delivering a much cleaner finish from a drivers’ point of view. It’s far more user friendly. On the Titanium models and above, you’ll find an impressive 8-inch touchscreen as the star of the show, which soaks up many of those extra connectivity and entertainment buttons. Influenced by consumer interactions with smart devices, Ford claims the 8-inch tablet-looking touchscreen is twice as bright as competitors. Although it gets very hot – hotter than it should, we feel – there is no denying it’s good screen. 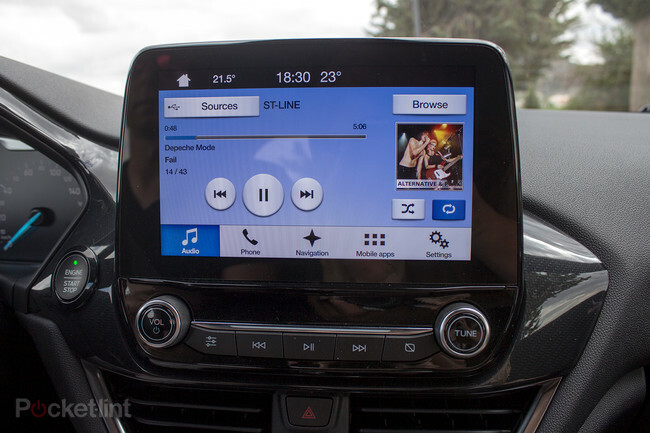 It’s extremely responsive too – impressively so for an in-car infotainment system. Sound is dependant on which model you buy. There is a standard six-speaker setup in most models, but there is a 10-speaker B&O Play system which can be bought as a £300/$450 option in models excluding the Style, but comes as standard in the Titanium X, B&O Play Titanium and B&O Play Zetec. This more premium sound system has a mid-range centre speaker that is mounted on the instrument panel – which looks a little out of place to our eyes – combined with two tweeters near the A-pillar, two mid-range woofers in the front doors, two integrated tweeter and mid-range woofers in the rear and a subwoofer in the spare wheel. The sound delivered is great and well-balanced, although the cost to upgrade means it won’t be justifiable for everyone. Seat upholstery is also dependant on the model you select. Partial leather seats start from the Titanium X model. 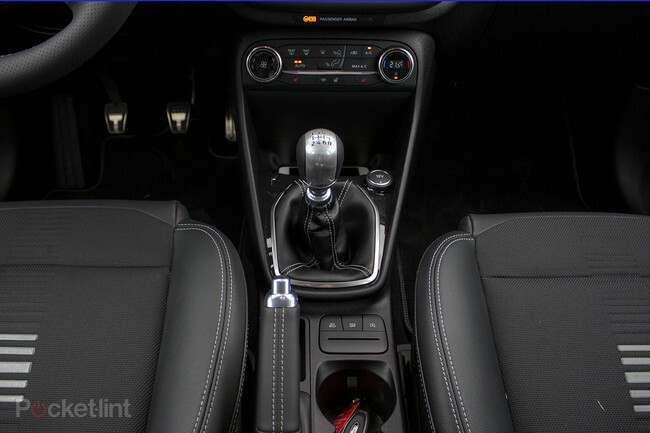 The ST-Line has sports-style front seats, as well as a flat-bottomed steering wheel. The Vignale is all about the leather: its seats (with their special pattern design) and steering wheel both feature it. There’s plenty of storage in all models, too, with a one-litre media bin within the centre console, cup holders in the rear doors and centre of the front seats, as well as a 20 per cent larger glovebox compared to the 2008 model. These cup holders in the centre are even illuminated from the Titanium model upwards, matching the dials within the driver’s dash, which is a nice touch. Ford has made the tailgate wider for easier access to the boot, which is ultimately quite small, but rear seat passengers do get an extra 16mm more knee room – even if this still doesn’t make the back huge. Overall, the front cabin is spacious and comfortable, while the materials used thankfully avoid cheap, tacky plastic in the most part. 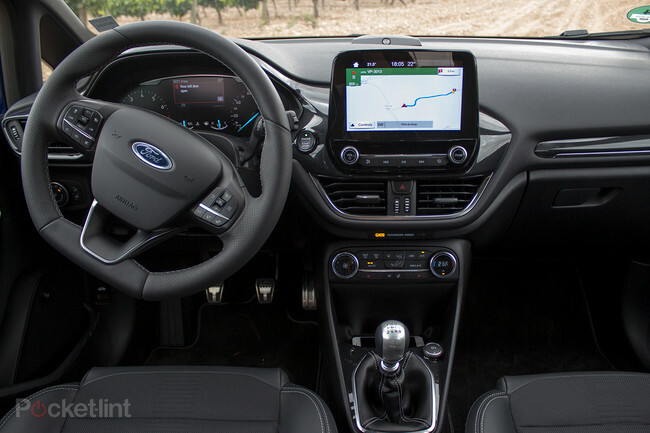 As you would expect, the interior of the new Fiesta is more luxurious the higher the grade model, but even at the lower levels, you get soft-touch materials on the main dash and a premium feel throughout. As per the exterior, personalisation options are also available for the interior of the new Fiesta, with decorative elements available for the central instrument and passenger-side instrument panel, door pulls and rear-view mirror cap. There are five colour options, including Race Red and Chrome Copper. 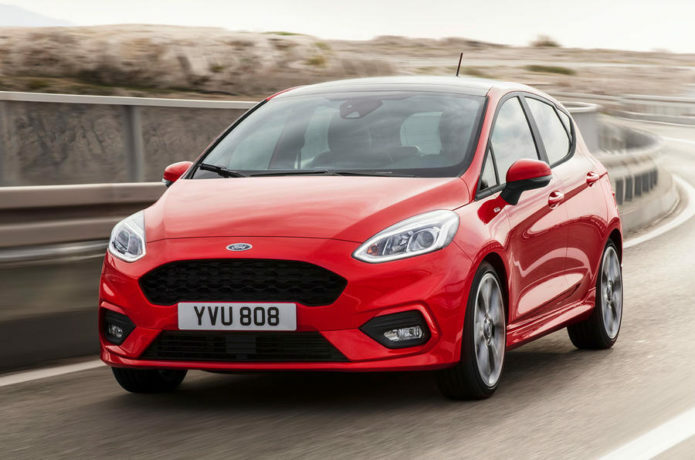 The new Ford Fiesta is available in numerous powertrains, comprising petrol and diesel engines and five-speed manual, six-speed manual and six-speed automatic transmissions. Engines range from a 1.1-litre petrol five-speed manual with 70hp and emissions of 101g/km CO2 to a 1.5-litre TDCi six-speed manual with 120hp and emissions of 89g/km CO2. We drove a Titanium model with the 1.5-litre TDCi six-speed manual 120PS engine which accelerates from 0-62mph in 9.2 seconds, as well as an ST-Line and a Vignale model, both of which had the 1.0-litre EcoBoost engine, offering 140hp, emissions 102g/km CO2 and acceleration from 0-62mph in 9 seconds. All three models were a pleasure to drive and fun, though the ST-Line was our preferred model. All models have 10 per cent more cornering grip than the 2008 model, supported Electronic Torque Vectoring, which uses the anti-lock brake and ESC sensors to detect if the car is drifting, gently applying the brakes on the inside or outside of the rear wheels respectively. The Titanium diesel felt more grounded than the Vignale petrol, which gave us greater confidence when taking those sharper corners on the winding Spanish roads. The ST-Line petrol model offered firmer suspension than both the Titanium and Vignale models, ultimately delivering a more exciting ride, which is why it was our favourite. It delivered the perfect balance between sporty and comfortable, soaking up enough of the uneven surfaces so that even a longish drive was no drama. Like the Kia Rio and the Nissan Micra, the new Ford Fiesta offers plenty of extra safety technology and driver assist options. 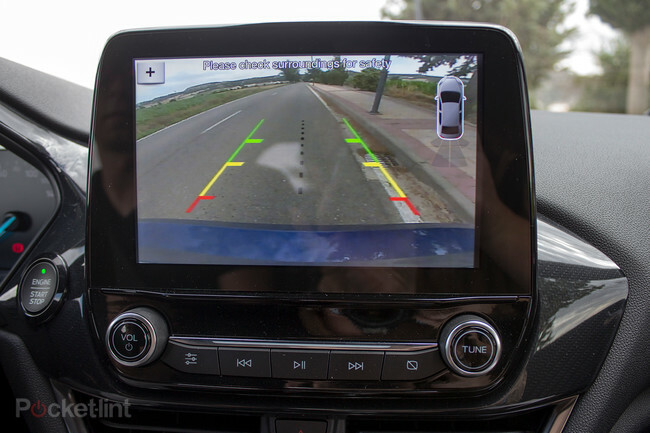 There are two cameras, three radars and 12 ultrasonic sensors on board, all of which contribute to the car being able to monitor 360-degrees around itself and scan the road ahead by up to 130 metres. A total of 15 driver assistant technologies are available, including Pre-Collision Assist with Pedestrian Detection, Traffic Sign Recognition, Auto High-Beam, Blind Spot Information System, Cross Traffic Alert, Driver Alert, Lane Keeping Aid, Distance Indication and Adaptive Cruise Control. The Pre-Collision Assist with Pedestrian Detection will even work at night, while another technology called Active Park Assist with Perpendicular Parking will not only help you park, but it will apply brakes if you don’t respond to system guidance and proximity warnings, stopping you hitting any other cars’ bumpers (or anything else). There is also Park Out Assist to get you out of a parallel parking space with ease. Many of the assist packages are available as options rather than standard. The bottom-end Style does still offer the NCAP pack that includes Lane-Keeping Alert and Lane-Keeping Aid. The Titanium model adds Traffic Sign Recognition, Auto High Beam and Driver Alert. The other assistant technologies come as option packs, with prices ranging from £200/$300 to £500/$750 per pack. Keyless start and Cruise Control are available as standard on the Titanium model and above. 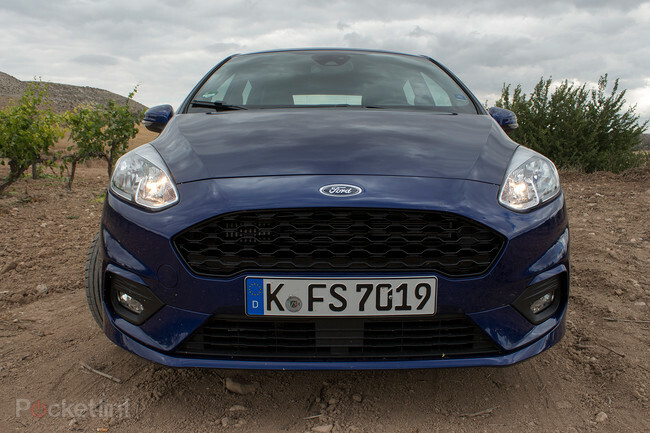 The new Ford Fiesta cements its position as a truly fun car to drive. The customisable exterior offers a more premium design that is softer and simpler than its predecessor, while the interior is just as great, with lovely materials that continue the premium trend set by the exterior. The streamlined controls, fabulously responsive touchscreen and plethora of technology on board – in both connectivity options such as Apple CarPlay and Android Auto and driver assist technologies (some of which you’ll have to pay extra for) – make this car the one to beat in its segment. We’d recommend the Titanium or the ST-Line X model, which start from £16,145/$24,218 and £17,495/$26,243 respectively, in order to get a good selection of some of the great features, like the 8-inch touchscreen, 4.2-inch TFT instrument cluster and some of the more advanced driver assistant technologies. Ultimately, though, any of the 2017 Fiesta models are likely to win hearts all over Britain once again. It’s a fantastic supermini that proves it’s a very big deal.